GRIC established the Department of Environmental Quality (DEQ) on August 1, 1995. 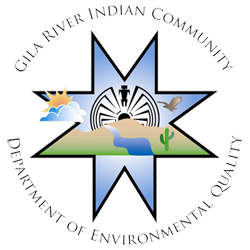 At that time DEQ brought together existing programs, including environmental education and outreach, pesticides, solid waste, and water quality—again, areas symbolized in the tribal seal. Today, DEQ has expanded to include an air quality program and specific waste programs that target hazardous waste and recycling. DEQ continues to pursue expansion to address the protection and conservation of the Community wildlife and their habitat. Currently, there are seven (7) Community Ordinances that the department enforces.